On my trip to Boston, a light jacket was all I needed to keep warm, so I brought a cape that I could easily pack in my luggage without it wrinkling. I could also throw it on over any outfit, and bundle it up in a shopping bag or in my hands without worrying about wrinkles. I love Aztec prints because the colors are often muted and the shapes and patterns add interest to any outfit. My leather tassled loafers are also a must for exploring all across town because its comfortable yet stylish. 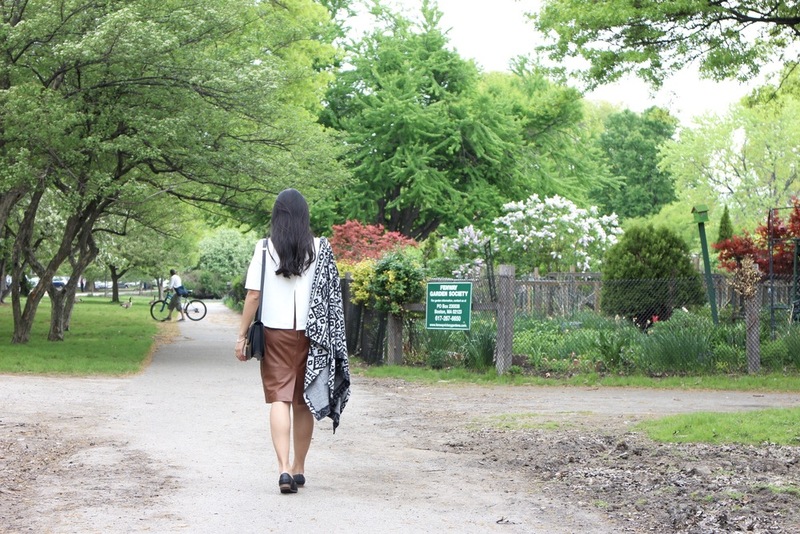 And the leather skirt is perfect for fall (and everyday!). Boston is a lovely city, with greenery all around, many parks and lakes, and the cutest shopping streets and cafes. The buildings are a mix of different architectural styles, each unique. The leather skirt with zip detail worn here was a steal from h&m, but they only have the black one left - and its on sale! I love zips, they add interest to an outfit, but are still understated. Although this outfit is a little skimpy for Boston weather now, it would be totally appropriate for our LA fall!